Chestnuts roasting on an open fire, Jack Frost nipping at your nose... there's nothing like a cosy wintry setting to make your Christmas even more special. Even better? Not having to slave away in the kitchen all day. From beautiful country house hotels to quaint B&Bs, thatched cottages and countryside inns, there's a host of places on offer to enjoy family-fun festive holidays for 2016. 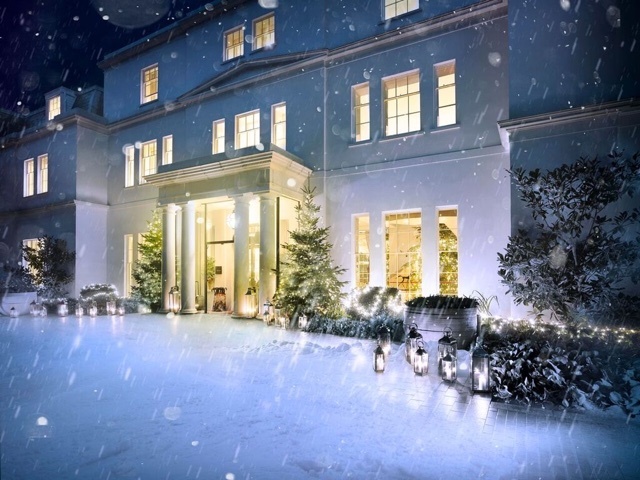 Treat yourself to mince pies and mulled wine in front of a roaring log fire at the upmarket Coworth Park in Ascot, where you can also take part in Santa Segway races on Boxing Day. Take a winter wonderland break at Galgorm in Northern Ireland, where the kids can wander down the river to the Christmas grotto and take selfies with Santa, before family time in the hotel swimming pool, movies, popcorn and a live singer. Wake up to stockings packed with presents at the snug Cotswolds spa retreat Ellenborough Park. While over at Eynsham Hall in Oxford, a Christmas Day Carvery is accompanied by balloon modelling, a magician, a chocolate fountain and a visit from Father Christmas himself. Or if you want to keep things simple, why not hire the pretty-as-a-picture Blacksmith's Cottage in Norfolk for a week? Run by the National Trust, it's oozing with traditional English chocolate-box charm. Fancy a festive seaside break? The Cary Arms in Devon is the perfect spot. You'll be treated to Devon cream tea, Champagne breakfasts, a lavish five-course Christmas lunch, evening cocktails and entertainment. And what could be more beautiful than a post-Christmas dinner walk along the stunning South West Coast Path? See our top picture-perfect traditional Christmas breaks below... Hohoho(lidays). Whether it's cosying up to a roaring log fire or enjoying a crisp walk through the 240 acres of snowy English countryside, country house hotel Coworth Park is a top spot for celebrating Christmas. You can enjoy luxurious accommodation in the main house or privately at The Dower House, both festively decorated to make you feel at home. A three-day Christmas package offers afternoon tea with complimentary Champagne, breakfast at leisure before a special visit from Father Christmas, an indulgent traditional Christmas feast at The Barn, and a viewing of The Queen’s Speech from the comfort of The Garden Room. On Boxing day, you can even enjoy Santa Segway races, a falconry display and chocolate masterclasses. Book it: The ‘Christmas Break’ package starts from £505 per person, per night, based on twin/double occupancy and dining in The Barn for Christmas Day lunch. Visit dorchestercollection.com or call +44 (0)1344 876 600. Despite is unseasonable name, this luxury boutique hotel pulls out all the stops for Christmas. Located in the picturesque village of Evershot in Dorset, which has been fondly dubbed Thomas Hardy Country, Summer Lodge is a magical place to spend Christmas with the whole family (pets included!). The beautifully restored Georgian manor house features a cosy bar with a fireplace, a comfortable drawing room, luxurious spa and indoor pool, and stunning rooms. On Christmas Eve, enjoy a traditional Dorset Afternoon Tea served in front of a blazing fire, before mum and dad join a wine tasting session with the hotel’s Master Sommelier. In the evening, families can head over to the local Evershot church to join the locals in carol singing before enjoying a scrumptious Christmas spread at the restaurant. On Christmas Day, families will wake to a stocking filled with plenty of treats, and enjoy a Champagne breakfast plus a traditional mouth-watering five course Christmas lunch. And on Boxing Day brunch is served until 2pm for late-risers. This beautiful five-star country house hotel is just outside Cheltenham Spa on the original racecourse grounds, and is the perfect place for a traditional family Christmas break. It’s the ideal spot from which to explore the sights of Cheltenham, all aglow for Christmas, or to stomp off into the frosty fields and hills of the Cotswolds (the hotel has Dubarry jackets and boots, and Hunter wellies you can borrow to go walking in) before curling up with a glass of sherry or two for mum and dad and a hot chocolate for kids in front of the stunning 15th century Great Hall's roaring log fire. There are loads of things for families to do in the surrounding area or you can stay in the warm and cosy up playing board games in the gallery and tucking in to delicious Christmas feasts. You’ll also receive a personalised stocking of presents for a home-from-home feel - without the washing up! Book it: There’s two packages to choose from, Casual Christmas or Yuletide Glamour, from £567 per night. Both offer goodies like mulled wine and mince pies, and Champagne receptions. Fancy a festive seaside break? The Cary Arms is the perfect spot. You’ll be treated to Devon cream tea, Champagne breakfasts, a lavish five-course Christmas lunch, evening cocktails and entertainment. While away the afternoons with relaxing games of billiards and enjoy brisk walks along the beautiful South West Coast Path. The Cary Arms also offers a selection of dog-friendly rooms so the whole family can visit for Christmas. Set in the heart of a 3,000-acre country estate 12 miles from Oxford, Eynsham Hall, a Grade II-listed mansion, is a true winter paradise. It offers stately charm, without the stuffiness, where you can enjoy the fresh air of the English countryside on long walks before settling down for a cup of tea in front of the toasty fire in the main lounge. Celebrate Christmas Eve, Christmas Day and Boxing Day with your family, with the new three-day Christmas Package. You can bring the children for lunch with Santa or join Eynsham for the annual New Year’s Eve Dinner Dance. A Traditional Christmas Carvery is available for the whole family with balloon modelling, a magician, a chocolate fountain and a visit from Father Christmas himself. Book it: Prices start at £485.00 per person for the three-day Christmas Package. Children 0-5 years are complimentary, and children six to 12 years are £70 a night sharing a room with parents. Visit eynshamhall.com. Where could be more festive than a cosy woodland lodge by the River Avon in the grounds of a medieval castle? Celebrate the joys of Christmastime in the lead up to the big day with a magical sleepover in the winter wonderland of Knight’s Village, welcoming guests for its first festive season (but closed 24 and 25 December). Events include the new Santa Sleepover (2,3,9,10,17 to 23 December) complete with an Elf wakeup call. There’s also storytime with Santa after breakfast and the option of an evening meal with Mr and Mrs Claus. Book it: Spend the night in a cosy two-bedroom Woodland Lodge by the River Avon, nestled in the grounds of Warwick Castle, from £40pppn based on four guests sharing, including breakfast and two days Castle entry with car parking. Visit warwick-castle.com. Galgorm Resort & Spa in Northern Ireland are offering a two-night spectacular Winter Wonderland break. You can enjoy festive cocktails and canapés on Christmas Eve as well as a lounge singer belting out Xmas tunes. Enjoy family time in the pool before toasting chestnuts and marshmallows on the open fire. On Christmas Day, you can take selfies with Santa, and enjoy a bracing stroll around the grounds before tucking into a sumptuous five-course lunch. The kids can visit Santa in his grotto down by the river, before popcorn and movies or Christmas games. Boxing Day starts with a full Irish breakfast, and there’s full access to Ireland’s first Thermal Spa Village, which includes a Celtic Sauna, Riverside Dutch Tubs and Snow Cabin. Book it: The Winter Wonderland two-night package starts from £395 per person sharing. Children under 12 years are £119 (when sharing room with adults) and children under four years are free. Minutes away from Highclere Castle, the set of Downtown Abbey, The Yew Tree is a true 17th century countryside inn offering quality British cuisine. There are eight cosy cottage-style rooms (all tartan, timber beams and William Morris prints) secreted away at The Yew Tree. For a little more privacy, the two ground floor rooms at the back of the pub have their own private entrance with dog beds and bowls available for any four-legged travelling companions. This Christmas, the whole family can enjoy exquisite dishes made from the freshest of locally-sourced ingredients. After a crisp wintry ramble in the Berkshire and Hampshire countryside, cosy up by the large log-burning fireplace and enjoy the welcoming comforts of a charming country pub with rooms that feel like a home away from home. In the surrounding area, you can take part in a clay-pigeon shooting lesson at either Owls Lodge, Spitfire or Roundwood shooting grounds, or visit nearby Winchester for markets, shopping, events, arts and culture. Book it: £125 per room/per night B&B. Christmas Day Lunch £80 for four courses. Visit theyewtree.co.uk. How about your very own fairytale gingerbread house for Christmas? Once occupied by a family of estate workers, Blacksmith’s Cottage is one of the few original thatched cottages remaining in the iconic setting of the Blickling Estate. With a chocolate-box exterior and a light, airy interior with exposed beams and white washed walls, this self-catering cottage (sleeps four) is the perfect place to cosy up with the family during a festive break. Get outside and enjoy crisp winter walks along the estate’s lakeside and woodland trails, before warming up at the nearby The Buck’s Arms, a traditional 17th century pub and former coaching inn. If you fancy really treating yourself this Christmas, head off to Jersey and book in at The Atlantic Hotel. The family-owned hotel overlooking the impressive St Ouen’s Bay is an upmarket home away from home. In the hotel’s Michelin starred Ocean restaurant, Executive Head Chef Mark Jordan has used premium local produce to create a series of special Christmas menus to be enjoyed throughout the stay. As well as eating delicious food, you can explore Jersey’s beautiful scenery with an invigorating coastal walk, explore the island’s pristine beaches, or even head to St Helier to lace up your skates at the ice rink. The antique shops of St Aubin are a firm favourite, and if you’re feeling brave, you could take part in the annual St Brelade’s Bay Christmas swim. Alternatively, curl up in the hotel’s cosy lounge alongside a crackling fire, whilst watching the waves crashing outside. What’s more, The Atlantic also offers a babysitting service (just fyi!). Book it: Prices start from £525 per person based on two sharing for a three night stay. This includes full English breakfast, Christmas Eve dinner, Christmas Day lunch, buffet supper and a Boxing Day gourmet dinner, all served in the hotel’s Michelin-starred Ocean Restaurant. A hire car is also included for the duration of the stay. Visit theatlantichotel.com. How about a four-star former hunting lodge decked with beautiful decorations in the New Forest? At the Balmer Lawn Hotel, children are well catered for with gifts, a kids’ club, and coach trip to see Peter Pan at Southampton’s Mayflower Theatre. Grazing outside your window are the famous free-roaming New Forest ponies donned in thick, fluffy winter coats. Guest boots are on-hand for exploring tracks and trails, before returning to roaring log fires, deep leather sofas, and games for all the family. There’s also an indoor pool, spa, tennis and squash courts. Head to the coast for Christmas at the cosy yet high-quality Idle Rocks. Over the three days from Christmas Eve, you can enjoy Christmas Carols, pantomime, and guided Christmas walks around the beautiful, wintry countryside. Feeling lazy? Just relax in your luxurious room with harbour views, or catch a movie in the Secret Cinema. There's Midnight Mass on Christmas Eve in one of the country’s most beautiful and hidden churches, and the Christmas Lunch, five metres from the sea, really is an extraordinary way to celebrate. Book it: For two people and three nights, the Christmas break starts at £1071. Visit idlerocks.com, call +44(0)1326 270270, or email info@idlerocks.com. The Swan Hotel & Spa, located in the small village of Newby Bridge in the heart of the Lake District, has launched a set of holiday cottages called Nests. Sleeping up to eight people, they are fitted with full kitchens, bespoke bunk-beds and cosy outdoor fireplaces for the evenings. Rooms are outfitted with games and activities for the little ones and the surrounding area is complete with the famous Lake District countryside trails and lakes to explore. Nest guests also have full use of the Georgian hotel’s cosy lounge, the beautiful spa and pool, as well as the health club. Santa will be popping by throughout December each Saturday for Family Festive Lunch. You’ve also got the choice of eating in your ‘Nest’ if you’re feeling lazy. Book it: A four-night stay at the Nests sleeping eight begins at £590. Christmas Day Lunch & Supper plus two nights B&B at the hotel starts from £580 or three nights B&B from £630. Snuggle up while you’re waiting for Santa in a pretty stone cottage (sleeping four) set in rolling countryside near the village Mathry. It is full of character - great for a traditional festive break – and has a sitting room with a large inglenook and woodburning stove where you can side flame-side drinking sherry and toasting marshmallows (perfect for you, not so good for Father Christmas). It is set in grounds of nearly one third of an acre, there are lots of footpaths for exploring nearby and the Pembrokeshire Coastal Path and the seaside village of Abercastle are six miles away. Book it: A seven-night holiday from 21 December costs £530. Call 01437 772760, or visit coastalcottages.co.uk. Celebrate in style at Wigglesworth House and Cottages’ - two lovingly restored properties that are perfect for Christmas escapes. Each will be tastefully decorated for the festive season and you'll be given a bottle of Champagne, a special cheeseboard from a local award-winning cheesemaker as well as a Welcome Pack of locally-sourced goodies to get the party started. What’s more, nearby attractions include the village pub, The Plough with its roaring fires, the market town of Settle, and Gisburn Forest, a walkers’ and cyclists’ paradise. Book it: A seven night stay for four at Cross Cottage arriving on 23 December costs £850, which includes a seasonal saving of £99. Visit premiercottages.co.uk, or call 01729 840168.